Al's second domestic compilation album, released a few months before Alapalooza. The first compilation to earn Al a U.S. Gold Record, although both Greatest Hits albums had previously gone Gold in Canada. 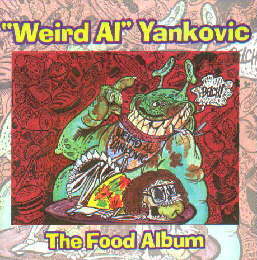 The only food parody at this point that was missing from this album, Dare To Be Stupid's "Girls Just Want To Have Lunch," was the casualty when Al had reached his limit on the number of parodies (or rather, on the amount of total royalties paid for the parodies) that he was allowed by Scotti Bros. to include. Al didn't necessarily mind, as he was kinda pushed into doing that song by his label, which insisted on DTBS featuring a Lauper parody for some reason. Oddly enough, the first track on this compilation, "Fat," isn't really about food to begin with! The cover illustration is by cartoonist Mr. Lawrence, who would later find fame as part of the creative team behind SpongeBob SquarePants, where he not only writes but also provides the voice of diminutive, evil buffoon Plankton. Released in Japan on August 20, 1993. 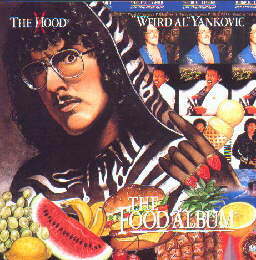 The Japanese version of this album (see pic at top right) included a bonus, eleventh track of "Eat It" minus Al's vocals. This oddity first appeared on the 1984 Japanese compilation The Official Music of "Weird Al" Yankovic. To read more about this coveted Japanese version, check out Jon's page at the Official Weird Al site! As with all of Al's Scotti Bros. albums, The Food Album had been reissued a couple of times, once through WEA and again by Volcano. The WEA reissue used the same unique, green font for the copyright information on the back cover that had been used on the original BMG release. For reasons unknown (perhaps monetary and/or technical), the Volcano reissue covered the past copyright info with a white panel with the new Volcano info printed on it in a black, boring font...while covering the Scotti Bros. logo with another white panel with the Way Moby logo printed on it. With both of these coverings slapped on, much of the album's original back cover art is now obscured. This page was last updated September 23, 2006. The Food Album ©1993 Scotti Bros. Records. ©1999 Way Moby/Volcano Entertainment III.